The icehat is a small (Raspberry Pi Zero-sized) board with a Lattice ice40 Ultra or Ultra Plus FPGA and three Digilent-compatible 8-bit PMOD receptacles. 4x Diagnostic LEDs (1 Configuration status, 3 FPGA user defined). 3x 12-pin Digilent-style PMOD connectors with 8 FPGA I/O each and selectable supply voltage. Lattice ice40 Ultra and Ultra Plus parts can be configured either from internal OTP flash or externally. 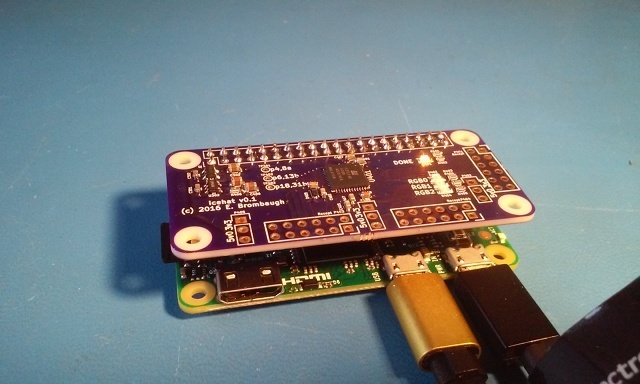 This board allows the RPi to configure the FPGA using GPIO and SPI available on the Raspberry Pi expansion port. A simple userspace library and command-line application is provided to download the bitstream. Once downloaded, the RPi SPI port can also be used to communicate with the design in the FPGA. Ultra Plus FPGAs are now supported by the Icestorm toolchain. Ultra FPGAs are not yet supported but are similar enough to Ultra Plus that they may well be supported in the future. Keep checking at the project website as more device support is added frequently. Assembly: This was one of my first KiCad designs in a long time and there are a few aspects of the PCB layout that are... shall we say "non-optimum". In particular I neglected to use the "hand-soldering" footprint variants so assembly is somewhat more difficult than it really needs to be. If there is sufficient interest in this board I may update the layout to make it easier for hand assembly. Configuration GPIO: The FPGA configuration is done via the RPi SPI port with a few GPIO to provide the CRESET and DONE handshaking. I picked some random GPIO pins for this purpose but if there is a more standard way of doing this then I'd be happy to revise these connections. Configuration Flash: In general this board cannot stand alone - it relies on the RPi to provide the FPGA configuration because there is no on-board external flash storage. Yes, the OTP NVCM in the FPGA can be used but because it's OTP it's not a good option for development. It might be possible to add an external SPI flash memory but this would require some additional circuit work to allow programming from the RPi. Additional GPIO: I often do digital audio work, so I've connected the RPi I2S expansion pins to the FPGA in order to allow the FPGA to be inserted into the audio processing path. 2016-10-27 - PCBs back from fab. 2016-10-30 - PCB assembled and verified. 2016-10-31 - Web page created. 2018-01-21 - Successfully tested with Ultra Plus FPGA.